Mike Barratt returned from a six-month stint aboard the ISS in October 2009 and experienced a profound change in his sight - doctors found that Barratt’s retinas have microscopic folds on them, and the back of his eye, the optic nerve, is no longer round but has flattened. The space veteran used to be nearsighted, but now he has exceptional distance vision and needs glasses for reading. Barratt is one of 10 male astronauts who have not recovered from VIIP. Credit NASA. For the first time since the early 70’s humanity is preparing to venture beyond low Earth orbit. In so doing we’ll have to deal with a variety of potential health problems including visual impairment. Canada is continuing its efforts to be a leader in space medicine with a twofold goal. To help astronauts in space and by doing so help humanity on Earth. Astronaut David Saint-Jacques will continue that work when he heads to the International Space Station on December 20 this year. This article on visual impairment first appeared in the March 2013 Space Quarterly Magazine and is published online now for the first time. It is still relevant today though there has been success in diagnosing the problem. Anyone familiar with manned spaceflight will be aware of the myriad biomedical problems faced by long duration crews. Astronauts in orbit suffer from space motion sickness (SMS), atrophying muscles, bone demineralization and exposure to radiation. Now, as if those medical challenges weren’t bad enough, it seems long duration spaceflight may also be bad for astronauts’ eyesight. Over the past few years, about half the astronauts returning from long duration increments on board the International Space Station (ISS) have reported vision problems. Some have recovered. Some haven’t. Curiously, no female crewmembers have been affected. The reports of vision problems – visual impairment intracranial pressure, or VIIP, in NASA parlance – have prompted a number of studies, among them an assessment of (1) 27 NASA astronauts by the Texas Medical School in Houston. The astronauts who participated in the study  had spent an average of 108 days in space. Magnetic resonance imaging (MRI) scans revealed worrying phenomena never before observed in astronauts returning from extended time on orbit. To better understand how vision is impacted in the space environment, astronauts use onboard medical instruments like the tonometer to examine the health of eyes. Commander Chris Hadfield gives us an inside look at these instruments and demonstrates how they work. Credit: Canadian Space Agency/NASA. Four astronauts had bulging of the optic nerve, three had abnormalities in the optic nerve, and six had flattening (or ‘globe flattening’ to use the medical term) of the eyeball. Another study  that investigated VIIP in ISS crew members (Table) found similar clinical findings that included edema. These symptoms are very similar to those observed in patients diagnosed with idiopathic intracranial hypertension, a rare condition in which the pressure of blood is unusually high in the brain. Patients with the condition routinely suffer from blinding headaches, nausea, vomiting and visual problems, which can lead to blindness. "After a few weeks aboard the station, I noticed that my visual acuity had changed. My distant vision was not too bad, but I found that it was more difficult to read procedures. I also had trouble manually focusing cameras, so I would ask a crewmate to verify my focus setting on critical experiments." Given these symptoms are being observed in astronauts after four months on orbit, what might happen during a multi-year flight to Mars? After all, what is the point of sending some of the most highly qualified humans on Earth to the Red Planet if, upon arrival, they are unable to perform routine mission tasks? It’s a question that has to be answered, which is why NASA has placed VIIP high on its list of human risks and has initiated a comprehensive program to study its mechanisms and implications. This is what they have found. Once it became apparent how serious VIIP was, NASA began implementing pre and post-flight eye exams, including high-resolution MRIs of crew members’ eyes. From the data collated, there seems to be a pattern, with vision problems occurring in the first couple of months of flight before levelling off and plateauing after four to five months. Among the astronauts who reported visual changes after three months of a 6-month mission, one needed to use reading glasses when gazing at Earth while another crew member experienced scotoma (visual field defect), which resulted in him having to tilt his head 15 degrees to view instruments and procedures. In the latter case, symptoms persisted for more than 12 months post-flight. For some astronauts, the vision problems persisted for months after their return to Earth (Figure 2), whereas for others, symptoms resolved. 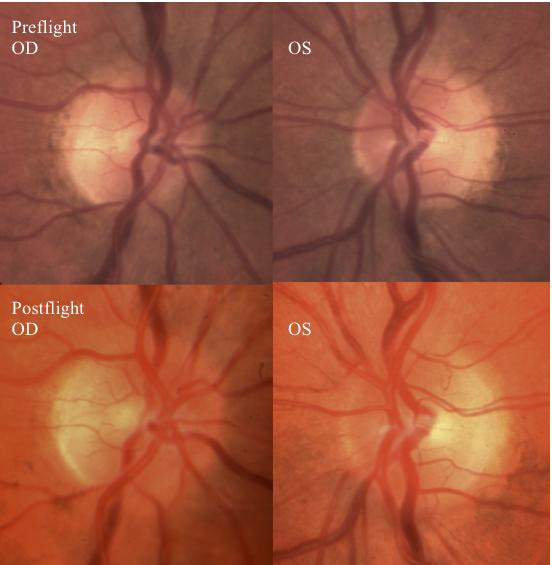 Preflight and postflight images of normal optic disc. Postflight right and left optic disc shows edema at the right optic disc. Credit: NASA. Since VIIP has only occurred in astronauts who spent extended time on orbit, researchers agree that the eye abnormalities appear to be unrelated to launch or re-entry. So what could be the cause? One theory is that increased pressure inside the head – intracranial pressure – could be the culprit. After all, every astronaut exposed to weightlessness experiences a headward fluid shift that causes increased pressure in the head. It’s a good theory, but the problem is that none of the astronauts who suffered vision problems experienced symptoms usually associated with intracranial pressure, such as chronic headache, double vision, or ringing in the ears. So researchers searched for another reason. Another possible explanation was that factors such as the abnormal flow of spinal fluid around the optic nerve, changes in blood flow in the choroid, or changes related to chronic low pressure within the eye were responsible. Or perhaps the eyes of astronauts over the age of forty, in common with the eyes of non-astronauts of the same age, had lost their ability to focus; after all, in the early days of the space program, most astronauts were military test-pilots with exceptional vision. One of the problems with this latter theory is that in the 1960s, spaceflights rarely exceeded more than a few days. The latest NASA study has found a link between abnormally low levels of a B vitamin called folate and the vision problem. It took a while to make sense of the link because when researchers checked the of the astronauts affected, none of them had low folate levels. So the researchers suspected enzyme polymorphism, a condition that can appear like a vitamin deficiency. Polymorphisms are hereditary biological variations, a good example of which is lactose intolerance. In the case of enzyme polymorphism it is the enzymes that are the culprit. Enzymes are required for the normal function of bodily processes, and when an enzyme malfunctions, bodily processes go awry. Unfortunately for astronauts, some enzyme polymorphisms appear not to work very well in microgravity. The clue to the link between enzyme polymorphism and the vision problem was a review of Earth-based studies in which certain enzyme polymorphisms had been found in those who suffer from conditions linked to intracranial pressure, which is suspected to be an underlying cause of astronauts’ vision problems. revelation has provided scientists with a new research direction by testing for the presence of enzyme polymorphisms, and verifies whether they are related to astronauts’ eye and vision changes. There is no question that microgravity-induced VIIP represents a risk factor of space flight and, in common with so many medical problems afflicting space crews, research continues to elucidate the mechanisms implicated in this latest malady; much of this research is coordinated through NASA’s Space Medicine Division in collaboration with the Space Life Sciences Directorate (SLSD). Note: Updated results and papers are available in NASA’s ISS research site. (1) A survey of 300 astronauts revealed that deteriorations were reported by 29 per cent of astronauts on short-term missions, and 60 per cent on long-term missions. (2) Adapted from; The Visual Impairment Intracranial Pressure Summit Report, NASA/TP-2011-216160. October 2011. Erik Seedhouse completed his Ph.D studies while working at the German Space Agency’s Institute for Space Medicine. He currently divides his time working as a space life scientist, author and Training Director for Astronauts for Hire. He is the director of Canada’s manned centrifuge operations.